You’re dedicating countless hours to writing, writing, and more writing in order to push out sales pieces for your product or service. Meanwhile, you’re crossing your fingers just hoping someone, anyone, from your audience bites onto what it is you’re serving. You end up slaving over reaching your conversion hopes and dreams, but it’s starting to take a toll on you and your business. Why? Because with writing comes plenty of room for mistakes (and self doubt). We’ve all been there—you’re not riding this train solo. And unfortunately, it’s not the gravy train where success and huge sales come with little to no work in the copywriting department. I’m first to admit crafting content that sells is no easy feat. Reason being, you probably find it easy to talk about your business, but when it comes to writing about it? Whoa. That’s an entirely different ballgame. You waste time second guessing yourself, which results in you settling for ho-hum copy that runs the risk of being inundated with imperfections—ripping the potential for conversions right out from under you. But, you can stop all that baloney right here, right now. How, you ask? Well, I’ve got just what you’re looking for. 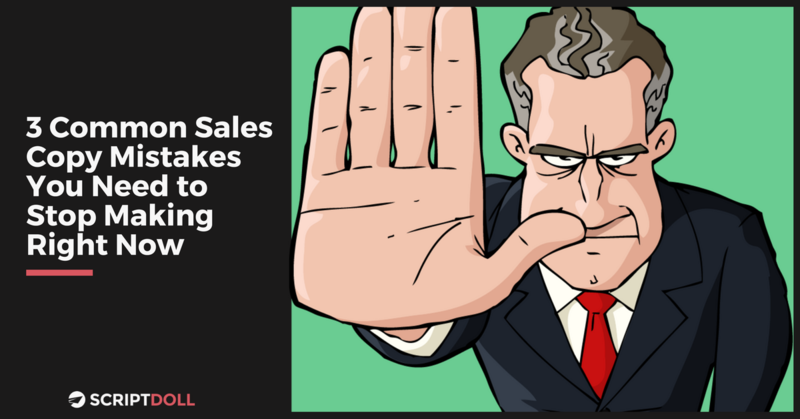 Today, I’m sharing three common sales copy mistakes we as marketers see entrepreneurs like you making far too often. It’s time to get serious about mending your writing and giving it the extra love it deserves. The days of letting poor-performing content sit around while hoping for the best should be put behind you. It’s only onward and upward, my friend. Writing attractive sales copy, however, isn’t just about avoiding silly mistakes such as the ones I’m about to mention. Good content lures your readers in. I know, easier said than done. I’m sure you find yourself wishing for a simpler way to write seductive sales copy quickly and efficiently. Well, thank goodness you’re here because I’ve got a one-of-a-kind tool I’d like to share with you. And, it was created with you in mind! Keep your eyes peeled below—you won’t want to miss it. 1. You’re talking too much stale, corporate gibberish. Want to lose the attention of your audience in a flash and soil your sales pages? Spew out buzzwords and corporate gibberish only the big wigs are using. Don’t get me wrong—business jargon might make you feel and appear “smart” around your colleagues. But, unfortunately, your audience could care less. Why? Because they just want you to speak their language. So stop throwing in that air-filled lingo that ultimately just takes up space on a page. What you can do instead is flip the switch in your brain that gets you thinking like your ideal prospect. Try to get out of your own head and into theirs—think about their biggest problems you’re helping to solve, speak the words they would use, mention the benefits and results that would motivate them to buy. Just promise you’ll save all that gobbledygook corporate speak for when you’re rubbing shoulders with the British royal family. 2. You’re asking your prospect to “take your word for it” without any social proof. When you’re perusing Amazon, are you one to buy a product without first reading the reviews? Yeah, I didn’t think so. And neither is your audience. Prove that others have found success with your product or service. You can do this via social proof, lending credibility to what it is you have to offer. What is that you ask? It’s human instinct that if someone else is doing something—buying a product, using a service, signing up for a newsletter, jumping out of a plane—then it must be a good thing to do. Social proof can give you the momentum you need (and are looking for) to help your sales skyrocket. Ultimately, Andy Crestodina from Orbit Media puts it best: “When you say it, it’s marketing. When your customer says it, it’s social proof.” Use real stories from real customers to share how they’ve found success thanks to your product or service. As a result, your prospects will get that extra kick in the rear they need to take action and join in on the fun. And you don’t have to go full throttle—simply share the story as if you were mentioning it to a friend over coffee and you’ll hit just the right level of appropriate, brag-worthy goodness. 3. You’re letting your copy fossilize instead of continuously testing and tweaking. Maybe it took you a while to muster up just the right amount of courage to sit down and write a chunk of content, then put it out there for the world to see. I get it. You spent all that time. So, why should you go back to test and tweak on the regular? Sorry, but the saying “if it ain’t broke, don’t fix it” doesn’t apply here. We live in a world where sales copy evolves over time. And what works for one brand’s sales content most likely won’t work for yours. Produce your own, original work and see what piques the interest of your audience. Now until forever, your goal is to make tiny tweaks to your sales pages and test them. Did that slight change get customers to take action, resulting in an influx of inquiries overnight? Great! Give yourself a pat on the back. But, don’t get too comfortable. And, don’t ever be too satisfied. Oh, and don’t think it has to be perfect. There’s always room for improvement to avoid your sales copy disintegrating into thin air, while ensuring you stay a few steps ahead of your competitors. Still find yourself spending hours crafting wishy-washy, flub-filled sales copy? That’s okay. But just hold up a minute before you toss and turn over how exactly you’ll solve that dilemma. I have just the solution that I think you’re going to love. It’s called ScriptDoll—your new, trusty sidekick (in the form of software) to help make the sales copywriting process a little less excruciating. Saves you time writing trial & error sales copy—simply complete your product portfolio, answer a handful of painless questions, and bada bing, bada boom. ScriptDoll turns your answers into enticing copy that drives sales. Best thing is, it takes the guesswork out of the writing process while helping you free up the amount of time it takes to craft five-star content! Keeps your copywriting in house—you can avoid spending thousands of dollars outsourcing your writing tasks to copywriters. ScriptDoll’s effective, flub-free templates are crafted for you thanks to its partnerships with first-class copywriters around the world. Creates ready-made profiles for your industry on a monthly basis—are you a puppy trainer, dentist, plastic surgeon or graphic designer? If so, things just got even easier for you! That’s because ScriptDoll has already created your product portfolio for you. And, there are many more ready-made profiles waiting to be used within the software engine. It’s more painless than ever for you to push out conversion-worthy content. Now the secrets out—you know what ScriptDoll is and how it can help your business thrive. So, I highly advise you seriously take a minute to think about what you hope life is like once you have this sales copy engine in your marketing toolbox. Can you envision your schedule (and desk!) freed up from hours upon hours of sales copywriting tasks? Less sleepless nights wondering how you’ll liven up your audience and get them to jump on your bandwagon? No more crossing your fingers and hoping for the best for your conversion rates? Your wish is my command. You can have all this and more—there’s no need to wait another second. Liven Up Your Audience—Get Your Attention-Grabbing Sales Copy Today! It’s time for you to bid adieu to lame sales copy that’s engulfed in all-to-familiar mistakes. And, say hello to turning your conversion hopes and dreams into a reality! No more corporate buzzwords. No more empty promises. And, no more settling. You’re now well aware of what not to do when writing sales copy. Biggest thing is, you finally have a reliable solution to help you quickly and effectively craft sales pieces that inspire your audience to take action. So, I’m sending this over to you. Are you ready to revamp your sales copy? I bet you’re nodding that brilliant mind of yours at this very moment. Go for it. The ScriptDoll success stories from entrepreneurs like you don’t lie—they were once in your shoes too. We hope you’ll join them because we’d hate for you to miss out on the serious, and possibly life-altering, results this software is serving up. Access Copy that Sells Today – Join ScriptDoll for $1!